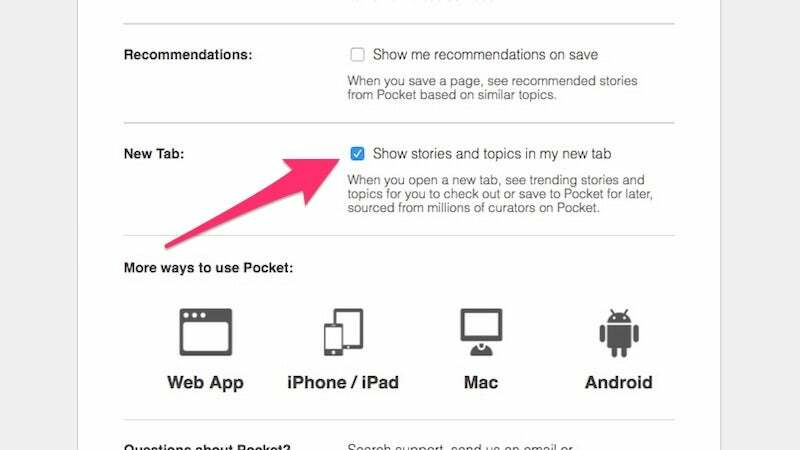 Last week, Pocket updated with a new feature that added trending stories to Chrome's new tab page. While neat in theory, the hijacking of a new tab is a bit annoying, and weirdly there was initially no way to disable it. Thankfully, now there is. To disable the awkward new behaviour, click the three dots icon in Chrome > More Tools > Extensions. Scroll down to Pocket, then click Options. Here, you'll see an option to disable the trending stories on the new tab page. If you don't see this option, go back to the Extensions page, scroll to the top and click "Update Extensions" then try again.